I love the idea of social commerce. I’ve worked for years in and around eCommerce operations and expect to continue to do so for the remainder of my working days. eCommerce is an engine that drives revenue for a business while providing a touch point for customers to a brand and a set of products and services. The technology, platforms, and interaction styles will change over time. But with each change eCommerce blends into different variations of electronic commerce that center around marketing, media, and operations. One such area that is starting, and I expect will grow as well, for retailers is social commerce. The big idea behind social commerce is to get consumers to collaborate while shopping online. The consumer becomes part of the eCommerce engine by helping with product creation, marketing, and even sales. 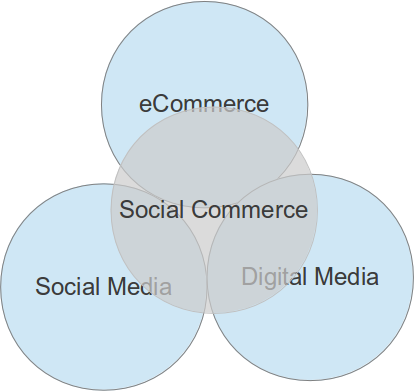 All of this is the result of blending social media, digital media, and eCommerce. In many ways the growing influence of social commerce for retailers is similar to the impact social media is having on the news media. Media outlets are now using consumers to spread viewership to articles, videos, polls, etc. by sharing the links with their friends and family. Retailers will try to follow this trend by allowing consumers to be brand advocates, designers, and sales engines within their own spaces. Would you buy a hip Converse shoe designed by your kids? Paul Chaney of Social Commerce Today discusses a good example of all this with the article Converse Facebook app for designing a Converse tennis shoe. The test is to allow the customer to design the tennis shoe and then open a store within Facebook to sell it to their friends. Can’t you see this working with middle school aged kids where everyone wants to be the same and not stick out in the crowd? It also opens the door for thousands of more ideas and expands the reach of what the existing designers and sales group within the company could do. Another example is from online fashion retailer Zara called People!. The idea is to create your own look by posing with items from the Zara catalog and then submit your picture back to them. If the contributors photo is selected it is published online and the contributor is paid. People like reality TV because it shows more everyday people in situations that might be real. I can see the catalog photos acting like this as well. Show me someone that looks like me rather than a fully staged model. This is a healthy evolution of digital social media. I realize brand advocates and referrals are not new to a marketing strategy for a business. The difference here is the use of interactive digital media to scale the reach of the customer. In the past word-of-mouth referrals happened one-to-one based on conversations. With social media sites, the customer can get a message reach to hundreds/thousands of connections all at once. Does this get us closer to answering the discourse about the ROI and financial contribution of social media? It certainly helps when there are activities that are trackable and revenue that is measurable. Expect more brands and marketers to try find the right combination of getting their customers to be a revenue producing connection with social media. What do you think about the growth potential of social commerce?